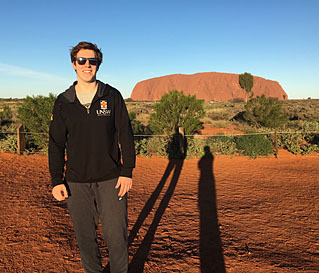 Michael Kaplan ’17 casts a long shadow over the Australian Outback. Michael Kaplan ’17 made sure that his first trip out of the country was a productive one. Scoring his first try in a rugby game for his university team. Camping in the Australian Outback. Road tripping out of a van for a week along the southern coast of Australia. 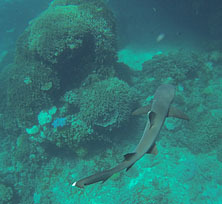 As for academics, he was able to take courses in advanced vibrations of mechanical systems, electrical and telecommunications engineering, and an introduction to mining engineering (all of which satisfiy degree requirements here), and another course in marine science. From left to right: Kaplan surfed in Sydney, played lawn bowling, and took a road trip along the Great Ocean Road along the south coast of Australia.